Last week, we learned that the Sydney Opera House just received official recognition as one of the most fabulous places on the planet, earning a coveted spot on the UNESCO World Heritage List (an honor it shares with such international treasures as the Taj Mahal, the Egyptian Pyramids and the Great Wall of China). Not bad for a building conceived just 50 years ago by Danish architect JÃ¸rn Utzon and finished in 1973…it’s the youngest cultural site ever to be included on the World Heritage List. As must-see, culturally important destinations go, this one certainly lives up to all the hype-few manmade structures thrill the soul quite the Sydney Opera House. I challenge anyone to stand along the waterfront at Circular Quay, spot the gravity-defying white “sails” billowing against a cloudless blue sky and not feel at least a little moved. It might have cost the city $102 million dollars to build (money they originally tried to re-coup by selling kisses with singers on the Opera House steps!) but the end result was-and still is-spectacular. 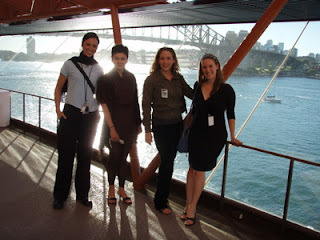 I must admit, Jen, Holly and I felt pretty jazzed when we received an invitation to visit the Opera House and learn more about its soon-to-be launched “Essential Tour,” an interactive program kicking off in August 2007. Trying not to sound too excited about having an excuse to dress up and act civilized, we responded “yes,” and started planning which martinis we’d order at the al fresco Opera Bar later that afternoon. Splurging on a cab down to the harbor (mustn’t ruin our one and only pair of heels), we headed past the box office to meet up with Steven and Megan, our dedicated guides for the one-hour tour. Once we’d all made introductions, our little quintet set off on a journey underneath the Opera House, passing through the quiet subterranean corridors that lead to each of the different dramatic venues. Each year, we learned, 1.5 million patrons catch 1,500 different shows on those five unique stages–making the Opera House one of the most active performing arts venues in the world. Our first stop was the experimental theater known as The Studio, an abstract venue where you can check out that sort of edgy, avant-garde stuff that’s so weird and disconcerting, its entertaining. Tickets to most shows are only about $20, so it’s a great way for the young and the budget-conscious to “go to the Opera” without going broke. Next, we took a peek at The Playhouse, a cozy 398-seat theater venue originally used for screening popular surfing movies (how very Aussie!) and now the backdrop for an eclectic menagerie of dance, comedy and classical theater performances. From there our group moved onto the midsized Drama Theater, where Megan let us sit down so she could share a bit of the history behind the Opera House. She explained that in the 1950s, the city of Sydney held an open competition for the design of a new concert hall and opera theater. After much deliberation, JÃ¸rn Utzon’s revolutionary concept was plucked from the reject pile and it went on to win the competition. The finished performance venue took 14 years to build (and went over its allotted budget by 95 million dollars!) but it was definitely worth the cash-and the wait! When most people think of attending a fabulous performance at the Sydney Opera House, they’re probably imagining a night in the 1,500-seat Opera Theatre-it’s the venue that The Australian Ballet, The Sydney Dance Company and Opera Australia all call home. Compared to the ultra-ornate Teatro Colon in Buenos Aires or the Paris Opera House, the Opera Theater is streamlined and spartan. But don’t confuse that with boring: the understated simplicity places the focus where is should be-on the performers. But the real jewel in the Opera House crown has to be the voluminous 2,679-seat Concert Hall, a gorgeous rose and cream-shaded space that somehow made me feel that I was sitting inside an enormous conch shell….and what a finely tuned shell it is. 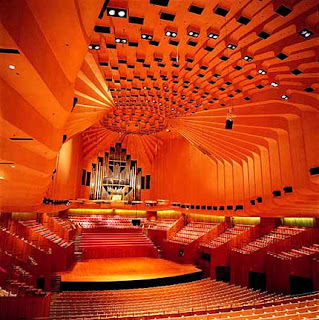 Since there’s no place to hide theatrical sets or for actors to run off to change, the venue is used almost exclusively for musical performances and concerts by the Sydney Symphony, Australian Chamber Orchestra and the Sydney Philharmonia Choirs, among others. 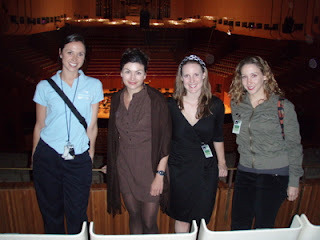 But before I could give the Concert Hall too much respect as a sacred musical space, Megan informed us that it was on this very stage that Arnold Schwarzenegger won his final Mr. Olympia body building title in 1980, and where the most recent Australian Idol was announced. Nice. Our tour wrapped up with a quick spin around the exterior of the building, where Steven shared that not only were the sparkling white roof tiles self cleaning, but one could, theoretically, park eight Boeing 747s, wing to wing on the Opera House site. He seemed to be such a wealth of knowledge that I asked him exactly how many of those self-cleaning tiles were on the roof of the building. We decided to cut Steven a little slack because he was cute…and he promised to hook us up with tickets to a show before we left Sydney. 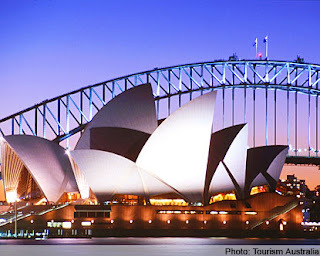 To learn more about the Opera House or to book a space on one of its tours, visit www.sydneyoperahouse.com.